You didn’t read that backward. 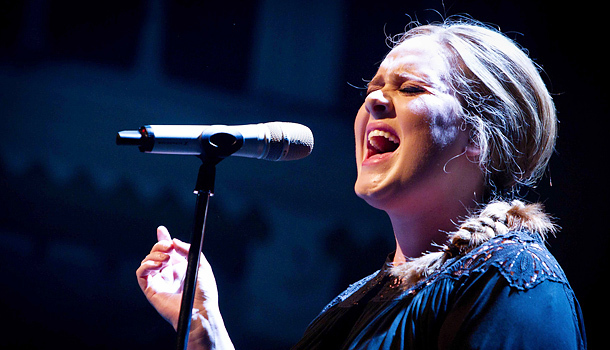 Adele was willing to have her album “21” available on the streaming music service. But Spotify would have had to change its whole strategy to accommodate her. If you were one of the millions of fans who tuned into Sunday’s Grammy Awards, you likely saw Adele belt out “Rolling In The Deep” from her chart-topping album and take home a half-dozen trophies, including prizes for Song of the Year and Album of the Year for 21. But as many quickly pointed out, you couldn’t get the songs from that Album of the Year on Spotify. It is not available for streaming there. Such jarring absences represent a constant criticism of the popular subscription-based music service’s catalog, and it’s a big reason why some consumers resist switching over from iTunes. Critics often highlight missing content on Spotify–say, albums from acts such as the Black Keys and the Beatles–implying that many big-name artists aren’t onboard with the streaming platform, or perhaps that the 3-million-subscriber-strong service with more than 15 million songs in its catalog isn’t yet ready for prime time. But, if it’s any indication of where the industry is headed, it turns out that Adele was indeed willing to have her album 21 available on Spotify–but given the option, Spotify ultimately decided not to stream the album, according to sources. Here’s why. Multiple sources confirm that Adele was willing to play ball with the streaming service, as long as the content was accessible only to paying subscribers and not to its freemium users. Spotify has a freemium-to-premium model: Users can gain ad-supported access to Spotify’s entire music catalog for free; to remove the ads and gain mobile access, users have to pony up as much as $10 a month. Ultimately, Spotify decided it did not want to split up its content catalog, so as to create separate music libraries for paying subscribers and freemium users. Thus, it was essentially Spotify that decided against providing streaming access to Adele’s content for paying subscribers–not the other way around. Instead, as some have noticed, Adele’s 21 eventually wound up on Rhapsody, which only offers paid subscriptions rather than a free, ad-supported service. On the other hand, Spotify, which declined to comment on the matter, demonstrated its commitment to its freemium-to-premium business model here. Spotify believes its free service will drive subscriptions–and it’s willing to sacrifice access to the best-selling album of the year over that belief. And with the service growing by roughly 8,000 subscriptions per day, boasting a 20% conversation rate, and touting a successful Facebook partnership, it’s hard to knock that content strategy. But most significantly, the insight proves that not all streaming services are built alike. The digital space is crowded with competitors–other players include MOG and Rdio–and they don’t all offer the same music in a different format. Adele’s 21 was available to Rhapsody’s paying subscribers; Adele’s 21 was not available on Spotify, even if you paid for a subscription. If anything, it shows how complicated this emerging platform has become for the industry, and the different priorities involved for artists, labels, and the streaming services themselves.